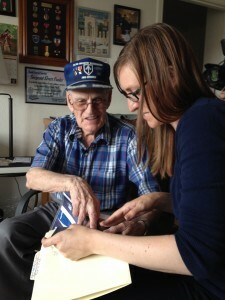 Curator Meredith Davidson interviews World War II veteran Elvert Pooler. Jacob Erickson long wondered about his grandfather’s service in World War II but, he said, “Understandably, he never wanted to talk about it—and he passed away a few years ago.” A new oral-history program started by Meredith Davidson, the museum’s curator of 19th– and 20th-century Southwest collections, and Department of Veterans Services Secretary Jack Fox fulfilled that interest for him. Erickson and Ivana Vidal, part of New Mexico Highlands University’s Media Arts program, were picked as interns, partly funded by Fox’s agency. They tracked down people to interview and videotaped Davidson’s conversations with them. Over the summer, the trio traveled from Las Vegas, NM, to Santa Fe, Rio Rancho and Las Cruces, interviewing a total of 18 men and women, including draftees, enlistees, and home-front workers. The Press at the Palace of the Governors will receive the Edgar L. Hewett Award by the New Mexico Association of Museums. The award is made to individuals or organizations whose actions exemplify leadership and service to the New Mexico museum community and for their achievements in the museum field. Past recipients include the New Mexico History Museum (2009), the Palace of the Governors Photo Archives (2011), and the Museum of New Mexico Foundation. In 1969, the museum acquired the contents of the Estancia News-Herald Print Shop and in 1972 gave birth to its own print shop. Facing the courtyard of the centuries-old Palace of the Governors, it welcomes thousands of visitors annually and serves as a vital center for the revival, stimulation, and pursuit of the book arts and frequently sponsors programs of interest to book-lovers. Award-winning, limited-edition books are published on historic presses, and a research library related to the book arts is available to the public during museum hours. It houses permanent exhibits that feature the press that printed the first-ever book of cowboy songs (1908) and a re-creation of the studio of renowned artist-printer Gustave Baumann. 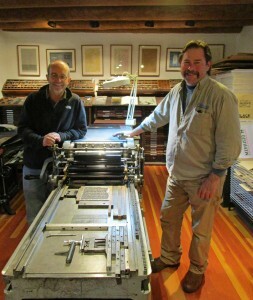 Two people carry out all that work: Curator and Director Thomas Leech (at left in photo), and Printing Specialist James Bourland. 1963 Chevrolet Impala, Owner Lee Cordova of Alcalde, NM, 1998. Jack Parsons, photographer. Palace of the Governors Photo Archives HP.2007.11. ¡Orale! Take a ride into the creative reimaginings of American steel as captured in photographs, hubcaps, hood ornaments, car show banners and, yes, actual cars. Lowriders, Hoppers, and Hot Rods: Car Culture of Northern New Mexico, opening May 1 (through March 5, 2017) focuses on mobile works of art and their makers—home-grown Nuevomexicanos who customize, detail, paint and upholster these favorite symbols of Hispanic culture. Photo Curator Daniel Kosharek has pulled together an extensive collection of images by Don Usner, Annie Sahlin, Jack Parsons, Sam Adams, Norman Mauskopf, Dottie Lopez, Gabriela Campos, Meridel Rubinstein and others. In addition, visitors will see a chromed and touchable engine, miniature-scale model-car collections, trophies, memorabilia and other ephemera. The museum lobby will host a rotating selection of cherry examples. And the thrill ride doesn’t stop there. 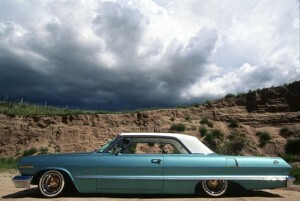 On May 20, the New Mexico Museum of Art will unveil an exhibit curated by Katherine Ware showing photographs and art inspired by car culture. Also in May, the Museum of New Mexico Press will release a companion book featuring essays by Ware and Usner. Military sons visiting their interned fathers and friends at the Santa Fe Internment Camp. Photo courtesy Shinoda Family Collection. 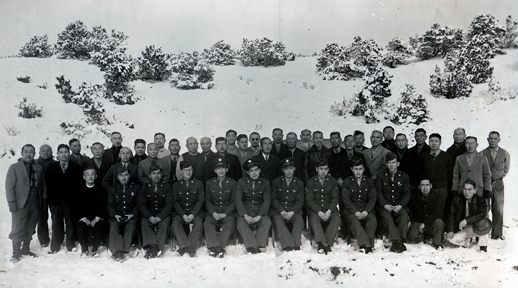 During World War II, Santa Fe was the site of one of the nation’s largest Justice Department internment camps. It primarily housed Japanese immigrants, among them the Rev. Tamasaku Watanabe. On Sunday, November 15, at 2 pm, Watanabe’s granddaughter, Dr. Gail Y. Okawa, speaks on a brain-twisting aspect of that heartbreaking period: Even as our government locked up Japanese residents over fears of their supposed disloyalty, their own children put on soldiers’ uniforms to defend the nation. When Black Bart was forced to choose between a ghost and a dancer, then suffered an untimely death, but was brought back to life by a genie, what was the moral of the story? That’s according to participants in the latest Community-in-Residence program held last month at the Santa Fe Opera and supported by the Alzheimer’s Poetry Project and the Academy for the Love of Learning’s Lifesongs program. 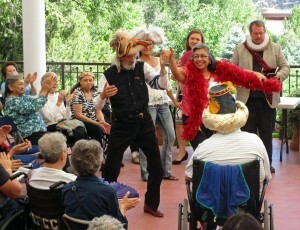 The New Mexico History Museum began working with Gary Glazner and the Alzheimer’s project several years ago, inviting people with memory illnesses and their care partners into the museum to enjoy an hour of creative poetry, music and dance inspired by our exhibits. Last year, we held a daylong conference on ways to use the arts to reach such people, which inspired other local arts organizations to collaborate on Community-in-Residence. The program offers occasional events at venues that have included the Museum of International Folk Art and Georgia O’Keeffe Museum.